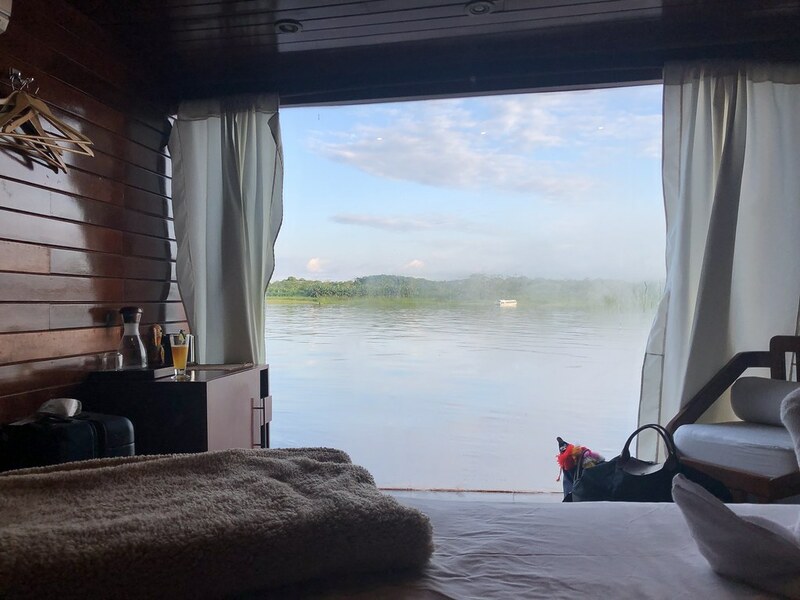 Our days on onboard the Cattleya would consist of breakfast in the dining room before heading out for either a ride in the skif along the shores to spot wildlife, or a jungle hike. Then back on the boat, lunch was a daily 3-course meal and for the most part we all thought the food was very good. 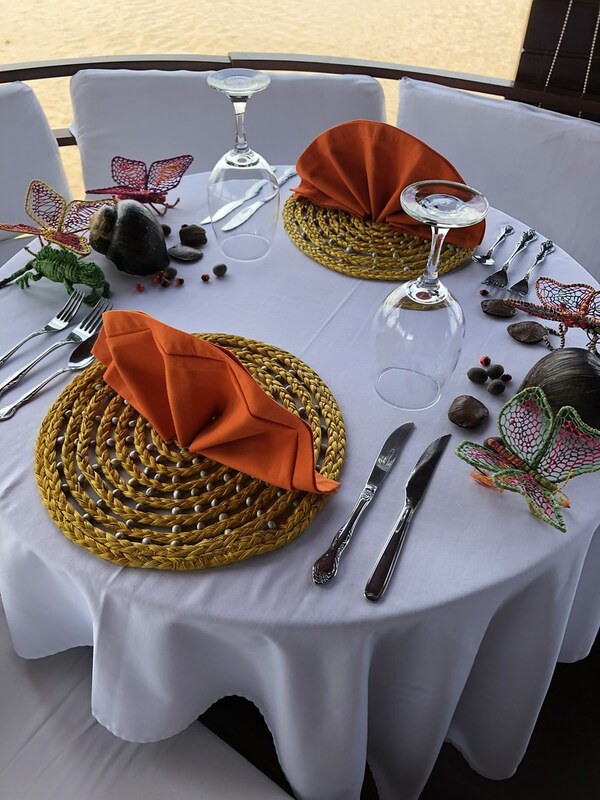 Although we had sent the booking company a note prior to our trip, letting them know that we would be drinking wine and/or beer with our meals, our bartender seemed unprepared at times. In the afternoons we would relax and take a siesta before heading back out on the skif in the early evenings to scout for more wildlife. Happy hour, dinner, and rounds of Exploding Kittens with cocktails capped off our evenings. 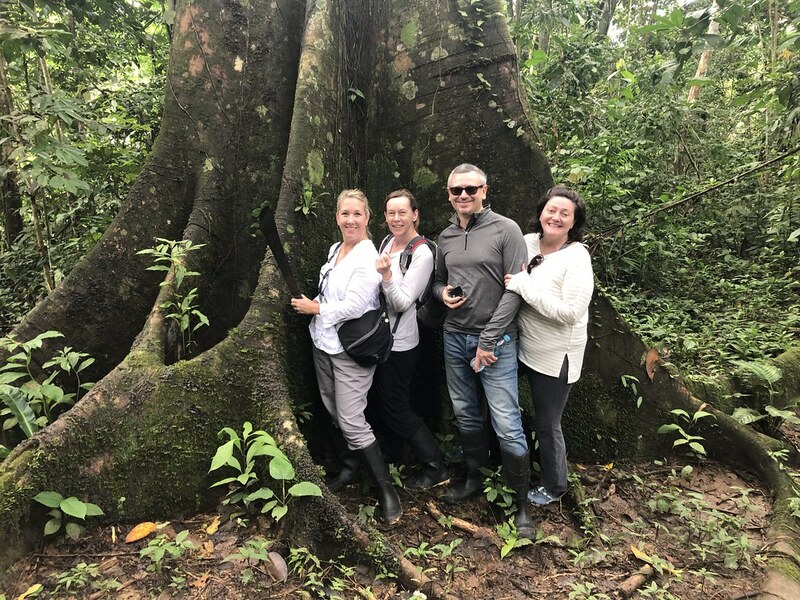 We specifically had to reign our naturalist Hilde in from trying to pack too much into our days as we wanted a very relaxing itinerary. 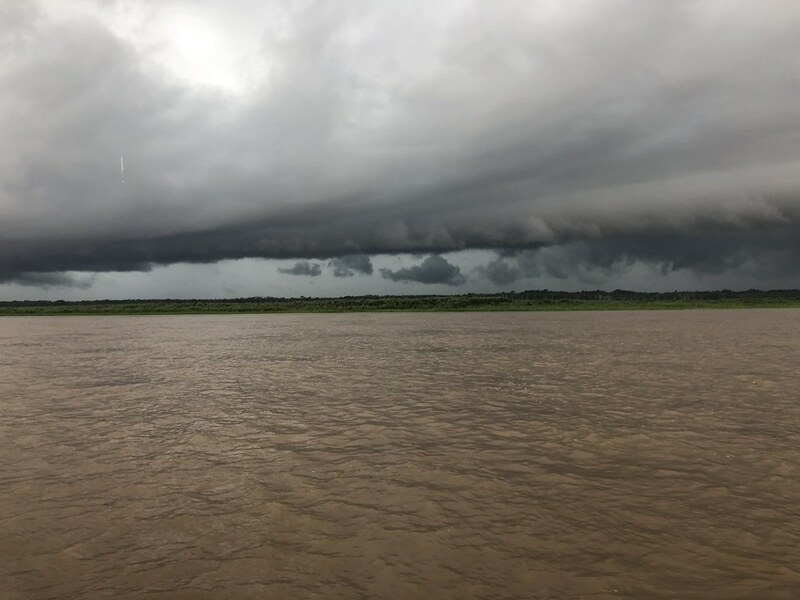 On our 2nd day after lunch there was a huge storm that made its way up the river and past us. It was exciting as the skies became dark, the rain came down hard, and there was even some thunder and lightning! Caitlin and I tried to sit up on the observation deck to watch but the rain was coming in sideways and soon we were soaked. I headed to my room to watch the storm from my cozy bed with my book. When I woke up from my nap, the clouds had brightened up and the rain had stopped. It was a beautiful evening for our skif cruise. As this was the rainy season, we would get a spot of rain, followed by sunshine pretty much every day. 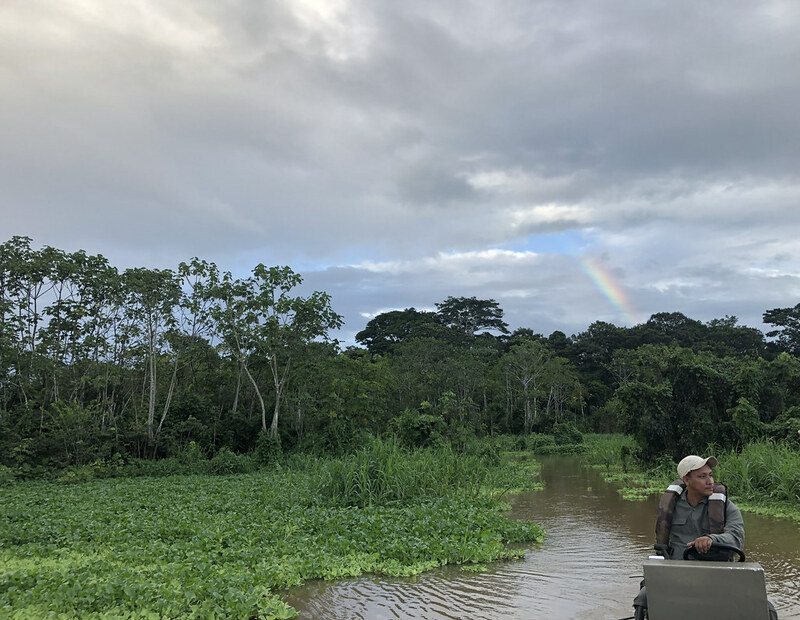 We went up a little tributary, which during the dry season would have been all ground, and past a village where boys were repairing a dugout canoe. 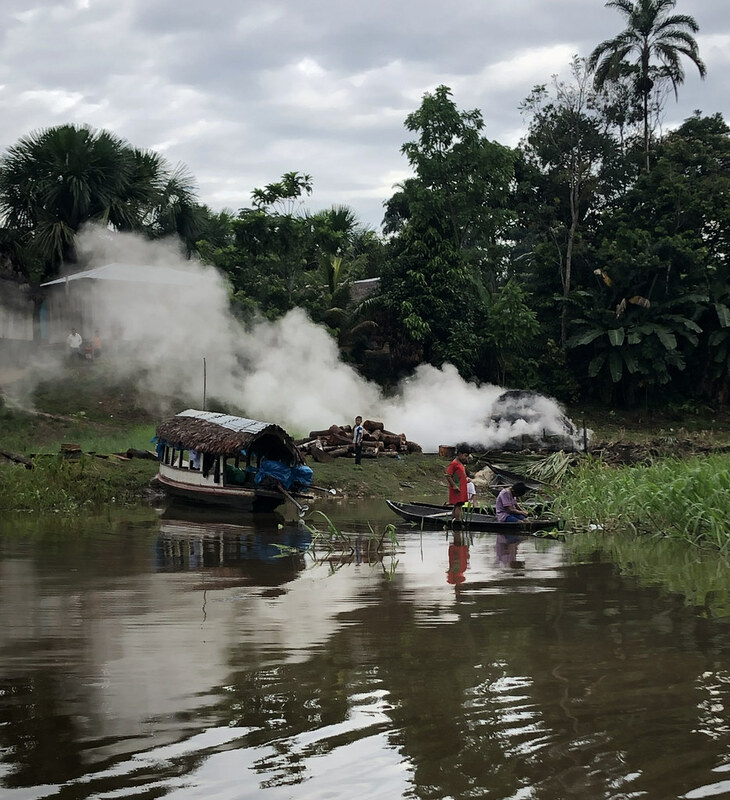 A fire smoked behind them as the villagers produced charcoal. 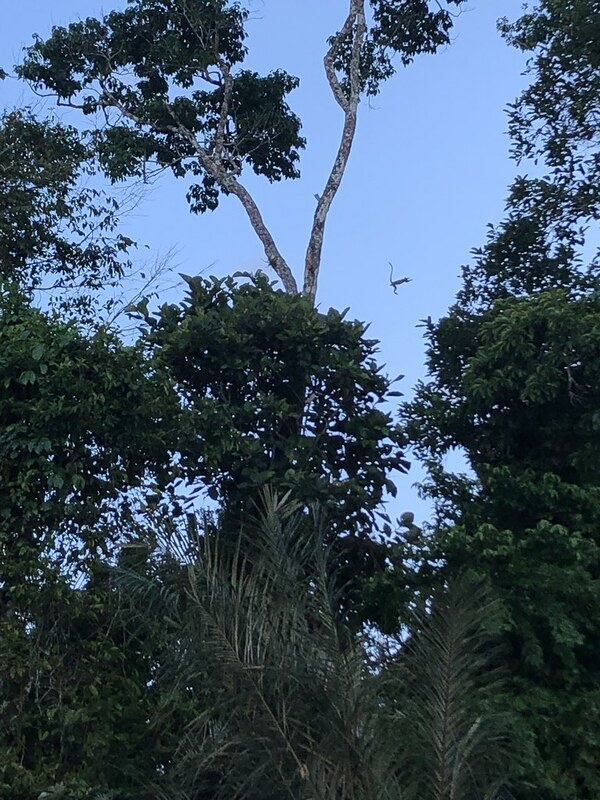 The sounds of many different birds surrounded us and Hilde taught us to recognize the difference between the parrots and the macaws flying overhead (tail shape). We spotted lots of parakeets, kingfishers, swallows, and kissadees. We continued upstream stopping to use the binoculars to look more closely at birds and bats that were perched in and on the trees. 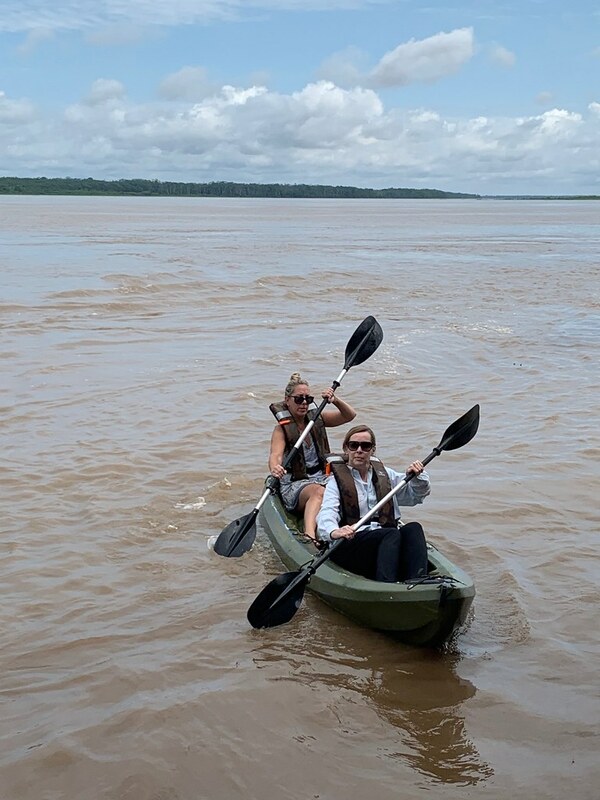 And then we maneuvered near the mudbank so Hilde and the skif captain Roy could teach us how to fish for piranha! The men took out sticks, tied a length of fishing wire to each, and attached a hook. Raw chicken was threaded on and then the lines were dropped into the river. 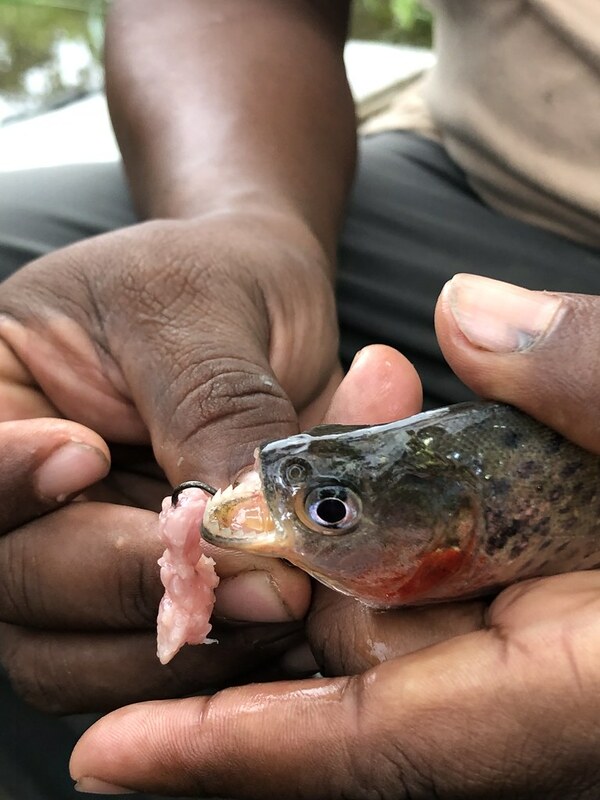 It didn't take long for the small but mighty fish to bite! Thibault, Forest and I tried also but couldn't quite get the hang of hooking them. We could all feel them having chicken dinner though! 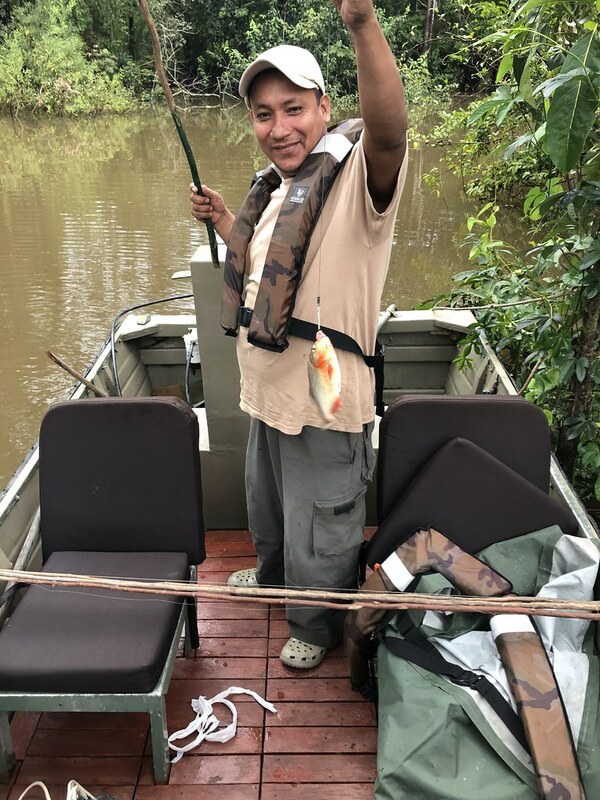 We even brought one of the fish home and Chef Francisco cooked it up for us to try! Back on board we had our Happy Hour of pisco sours before dinner. It was lovely watching the sunset on the river and watching the sporadic vessel pass by. 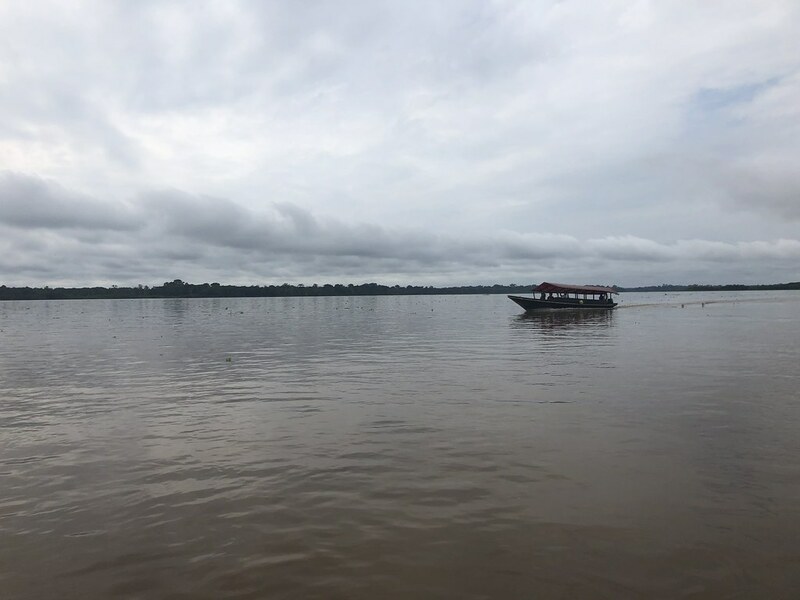 Unlike when we cruised on the Mekong, these rivers were much less trafficked. 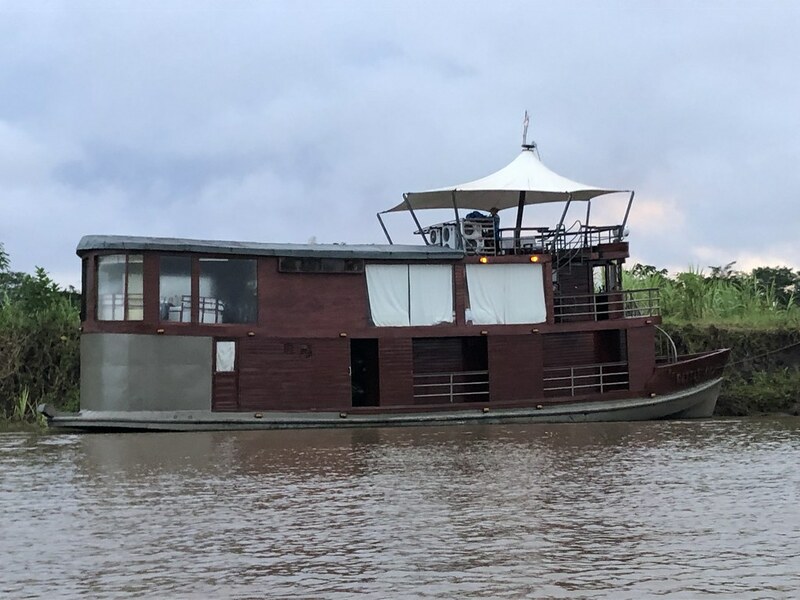 And during the evenings, only the overnight river taxis were spotted. We were up very early the next day and boarded our skif at 6am to try to spot animals before the heat of the morning. Immediately as we motored away from the Cattleya we spotted grey river dolphins jumping around. A bit further we spotted a very small troop of monkeys, but they were shy and retreated into the dense jungle as soon as they saw us. 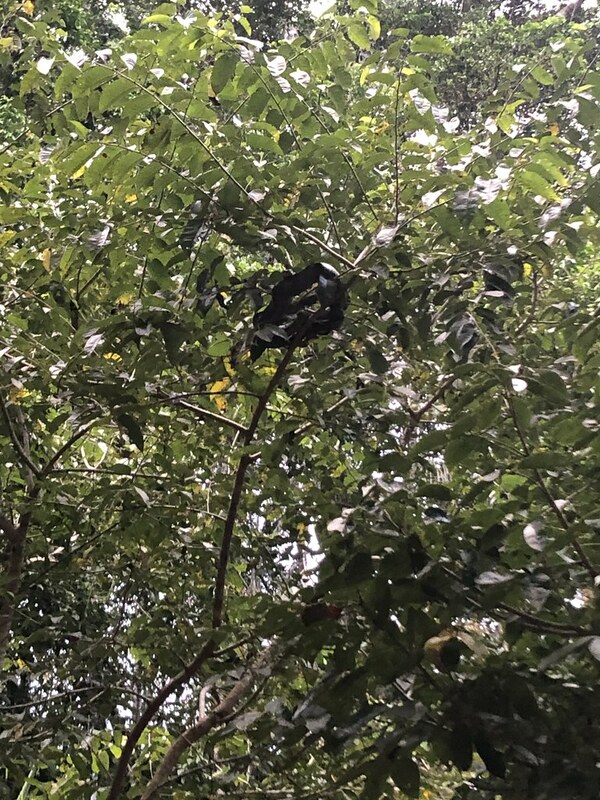 Then high up and pretty far inland, Hilde spotted a sloth. His silhouette looked like a small person in a hammock. Lucky we had binoculars! 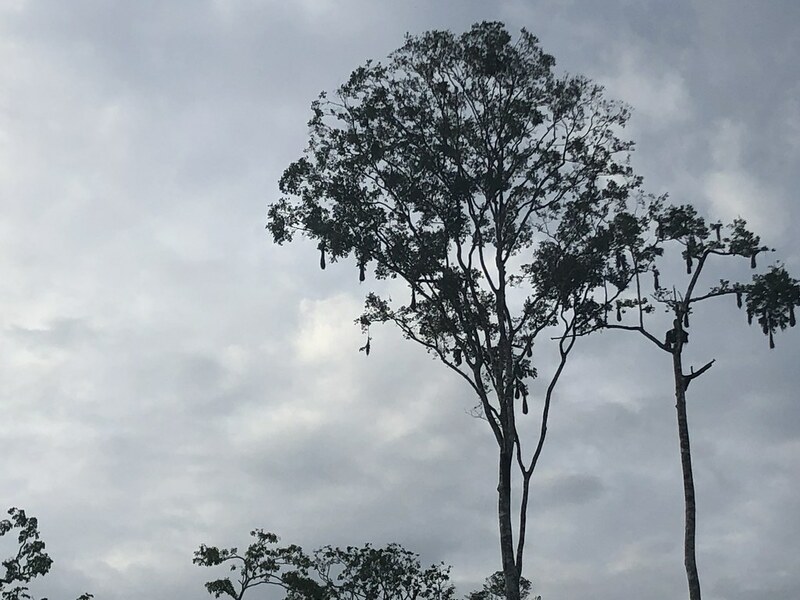 There were more birds, including egrets, parrots, jacanda, and a beautiful black-collared hawk that we sat and watched for a quite a while. We also came upon a local villager checking his fish nets. He held up his catch for us, which were some crazy prehistoric looking fish! After breakfast back on the boat we cruised up the river a bit until we reached another small tributary. 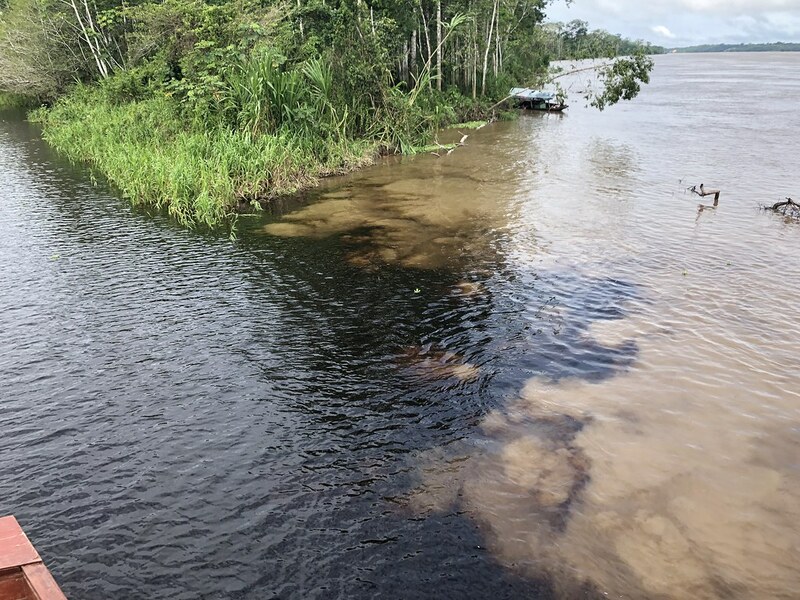 Where the two rivers met looked like oil and water! The confluence here also created a bit of wake and all of a sudden we saw pink dolphins playing in it! The captain moored the Cattleya and we all went to the observation deck and hung out watching them. They are quick and evaded all my photos but you can see a picture of them here. They have a strange almost albino look to them! Once the crew realized that they pod was planning on sticking around, they offered to put the kayaks in for us so we could paddle around with them! So fun! They continued playing, sneaking up behind and beside us, jumping right when one of us would turn around! Really an awesome experience! After a while we came back onboard and our boat set sail for the afternoon. We had a lovely lunch and Ronnie had set up quite the table-scape. Everything was going well until we requested wine with lunch and were told we were out. On day 3! And it's not like there is a 7-11 on the corner. Luckily we had brought a couple of beers with us from Iquitos, as well as some gin, and champagne. 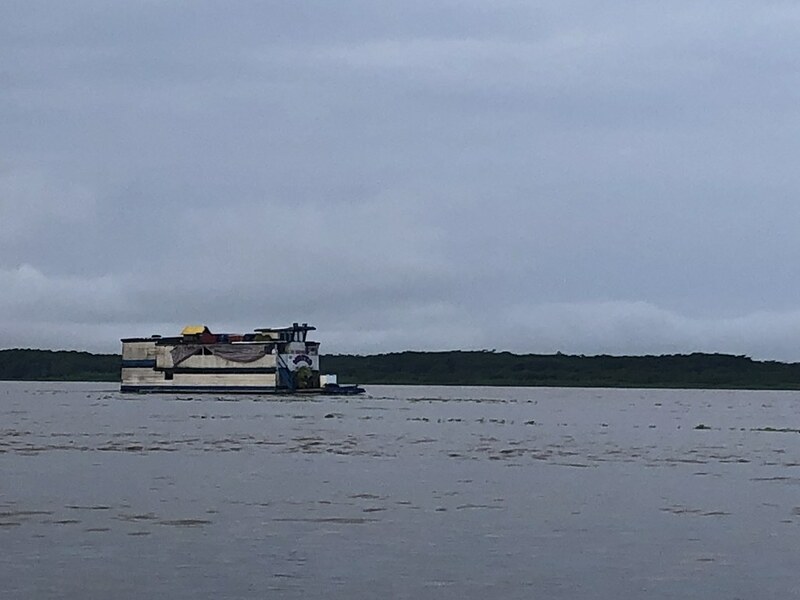 After lunch we sat up on the observation deck, drinking cold beers, and watching the life of the Marañón River as we headed towards are mooring place for the night, at the mouth of the Amazon River. Parts of these rivers are so wide, and there are countless little tributaries. 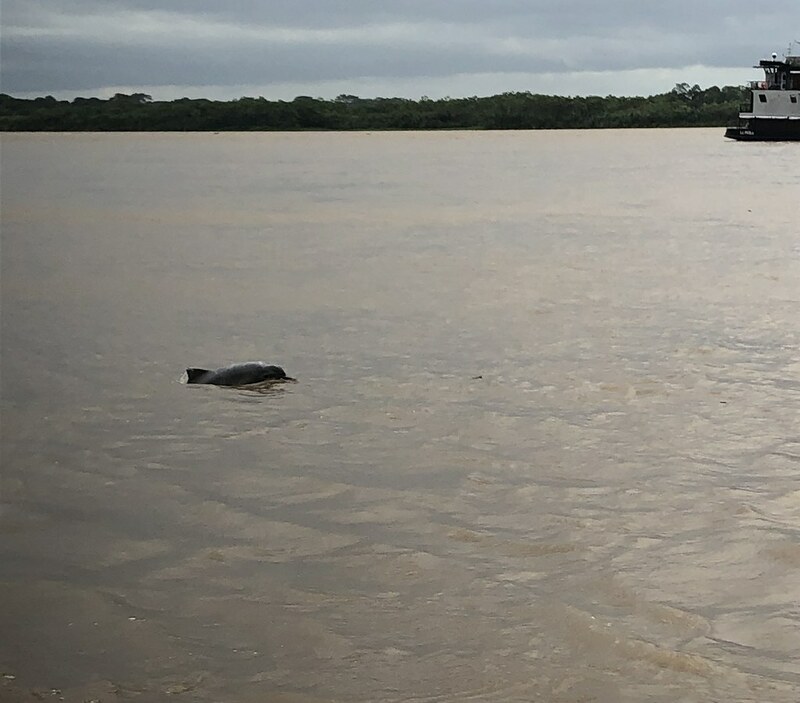 Later that afternoon, after my siesta, I saw that we were moored and when I looked out my window I had a little grey dolphin jumping over and over and over! He was there for hours! 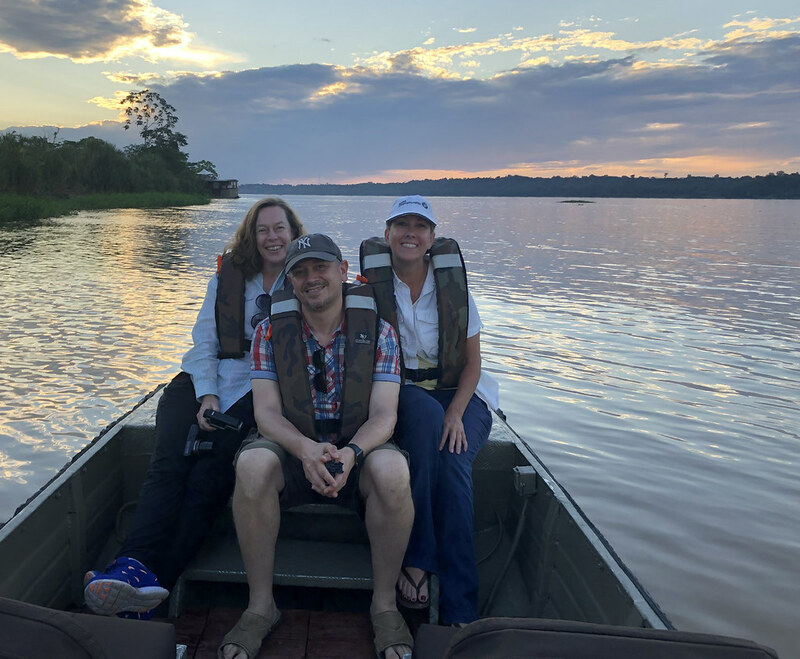 We got ready for our evening excursion, to the confluence of the Amazon River! This year's annual New Year's Eve trip was to Peru. It had been on my bucket list for a very long time and didn't disappoint! And the #PeruCrew2018, Caitlin, Thibault, Forest, and myself, is a tried and true travel team! I was more than excited! 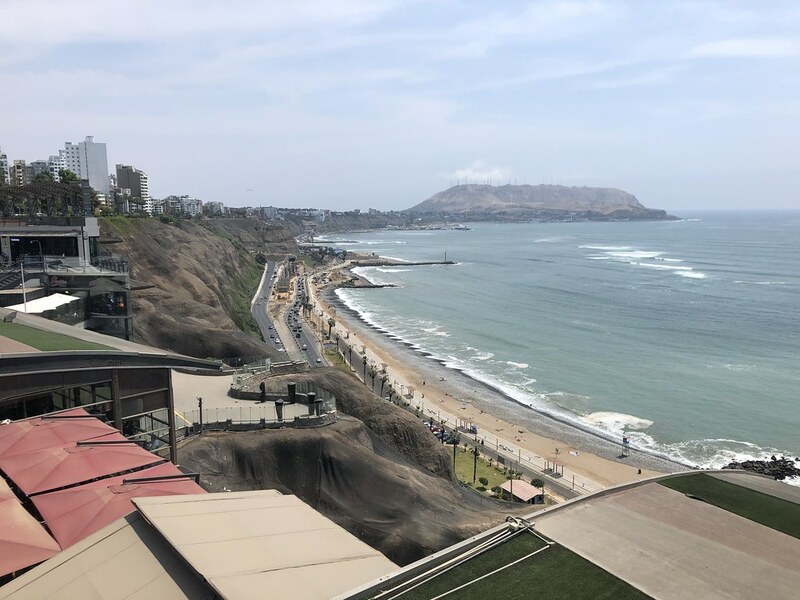 We started and ended our trip in the capital city of Lima. 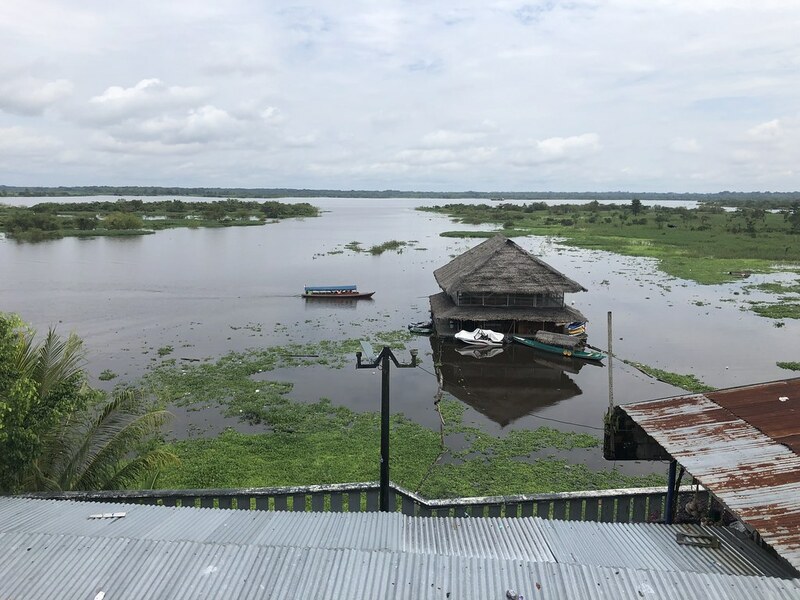 From here we flew to Iquitos, the gateway to the northern Amazon jungle and a town only accessible by plane or riverboat. It was pretty incredible flying over the Andes Mountains, they are so high that it looked like our plane was just barely above them! 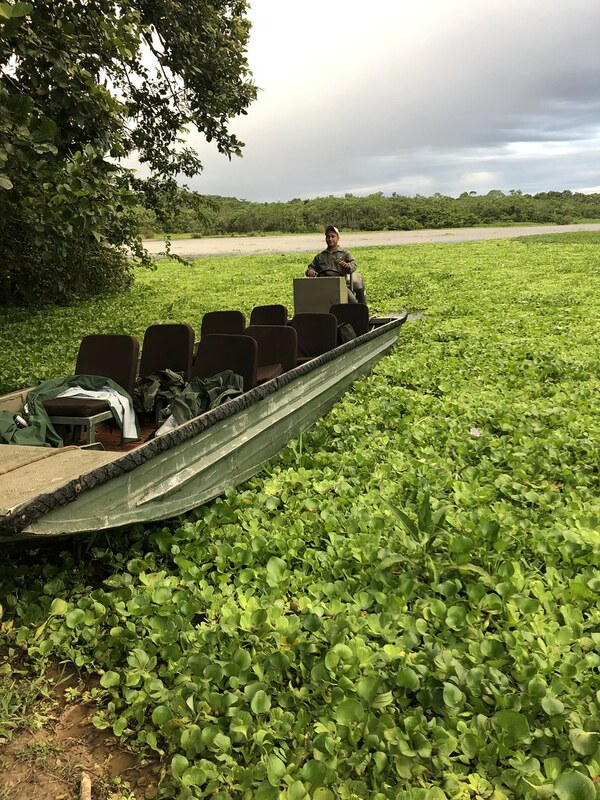 We had chartered our boat, the Cattleya, which came with a full crew, thru Rainforest Cruises. 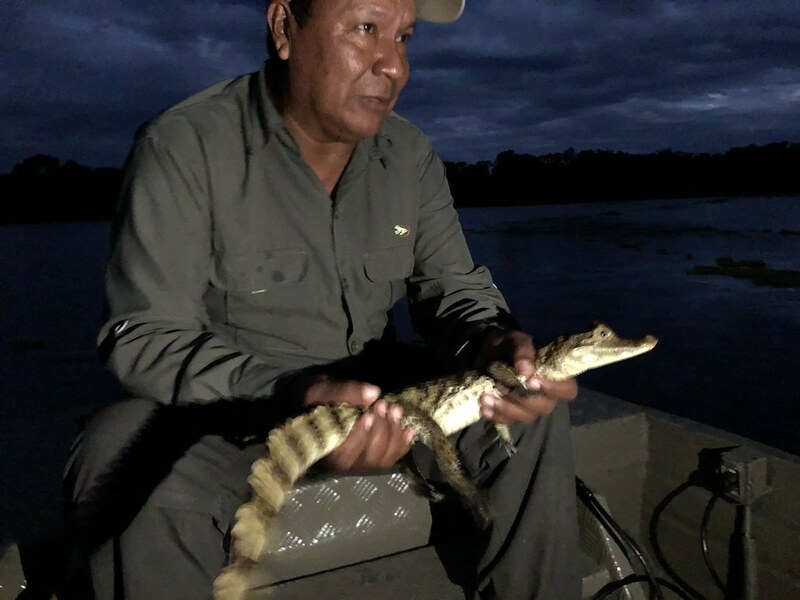 When we landed in Iquitos we were met at the airport by our naturalist Hilde and loaded into a private van. Originally we were to immediately take off for the 1 1/2 hour drive to Nauta for boarding, but the boat wasn't quite ready for us so Hilde took us into the town for lunch. 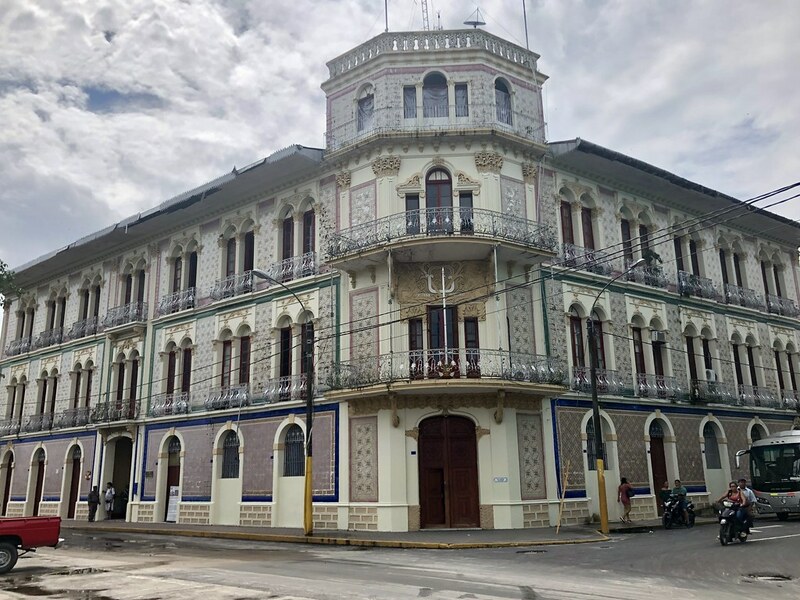 The town of Iquitos is quite cute, it reminded me a bit of Havana with it's pretty buildings slowly crumbling from lack of funds and infrastructure. Many of the buildings have incredible tile work that looked very similar to what I've seen in Lisbon. 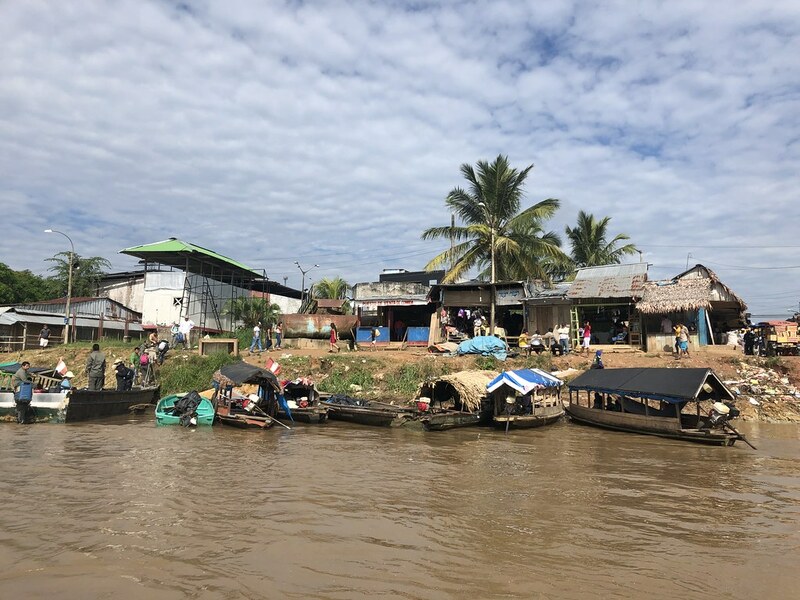 On the river the houses are built on stilts. 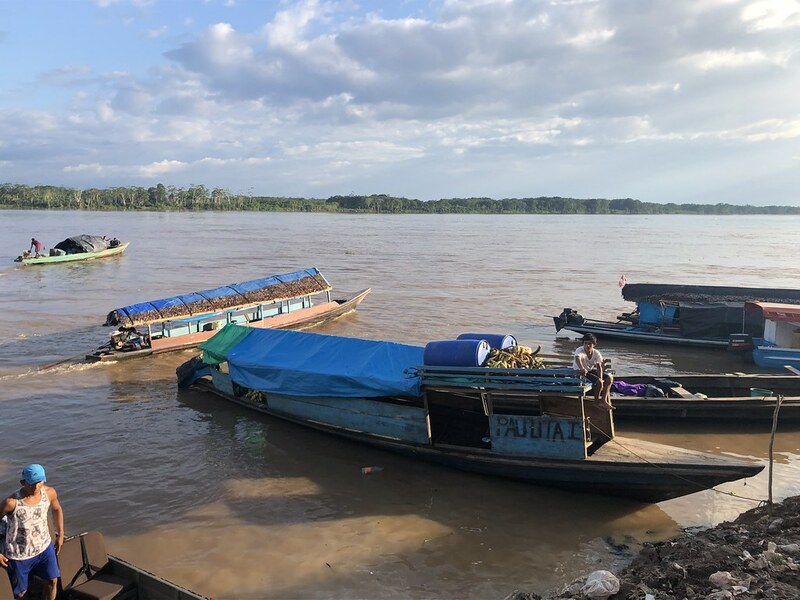 Since we were there in December, which is considered the wet season, the river was high and people used their boats or canoes to get around. These same houses would be surrounded by ground during the dry season. Incredible! 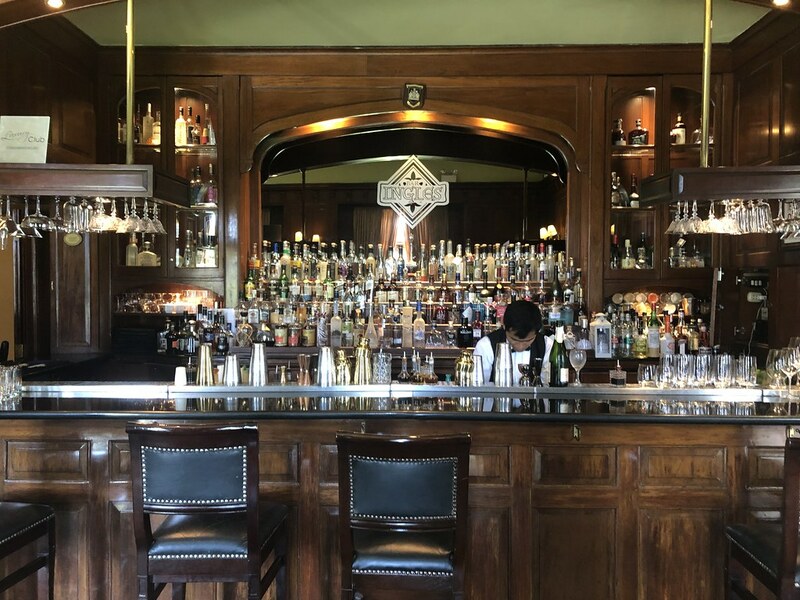 We had a very good lunch, and a few rounds of pisco sours, at Restaurant Fitzcarraldo, named for the movie which took place here. 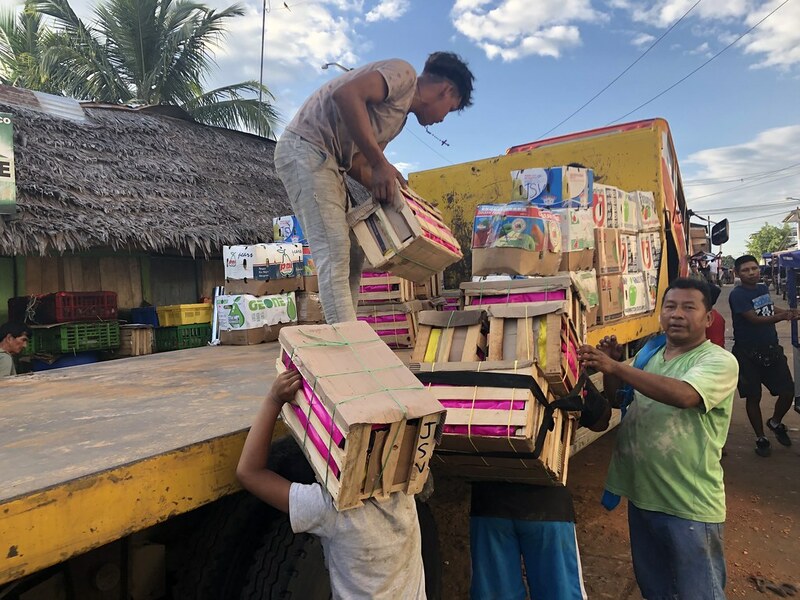 And then finally we were on our way to Nauta, the roads filled with tuk tuks and motorcycles, passing dirt lanes which led to neighborhoods of corrugated metal shack homes. 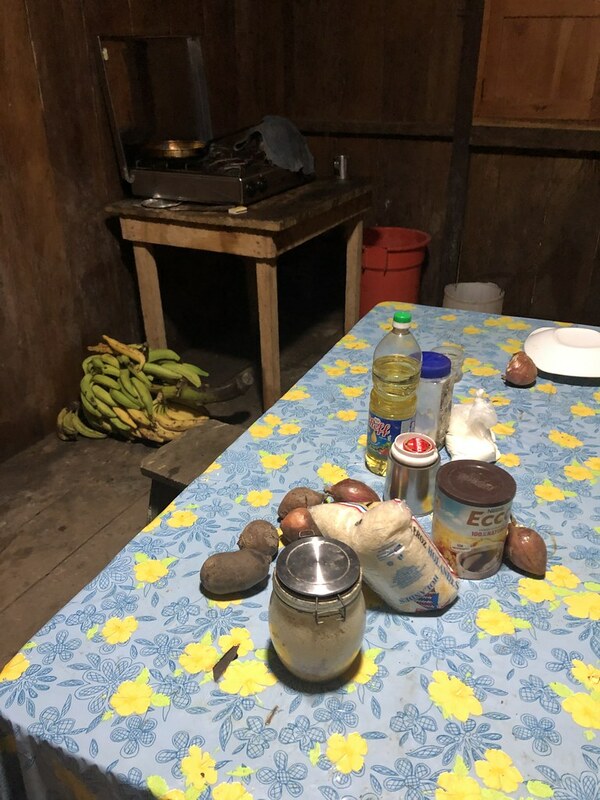 When we arrived in Nauta, I think we were all a bit surprised by the extreme poverty. There were dirt roads, thatched-roofed buildings, children running around shirtless and shoeless. There was no marina or even a real dock, just a mud bank busy with taxi boats and motorized canoes, loaded down with fruit, charcoal, and people. 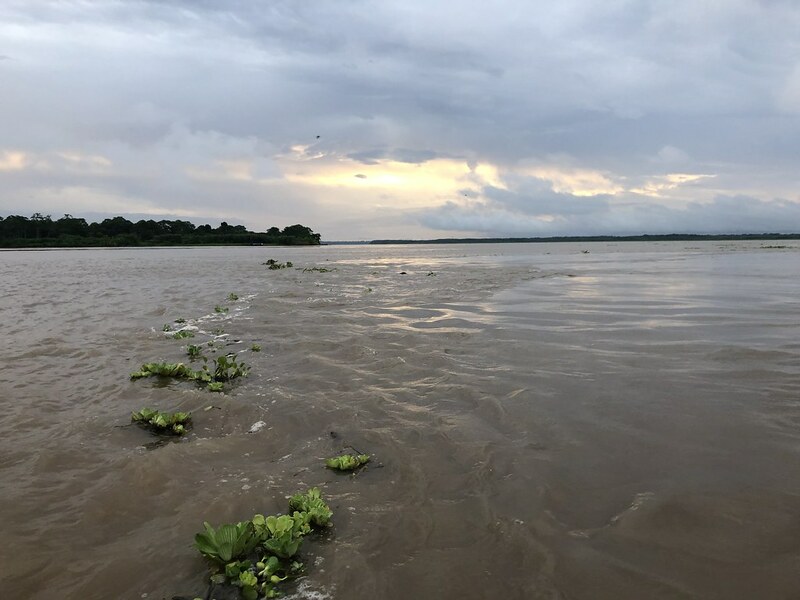 We were helped into our skiff, along with our luggage, and motored across the Marañón River, a major tributary of the Upper Amazon, to the M/V Cattleya. 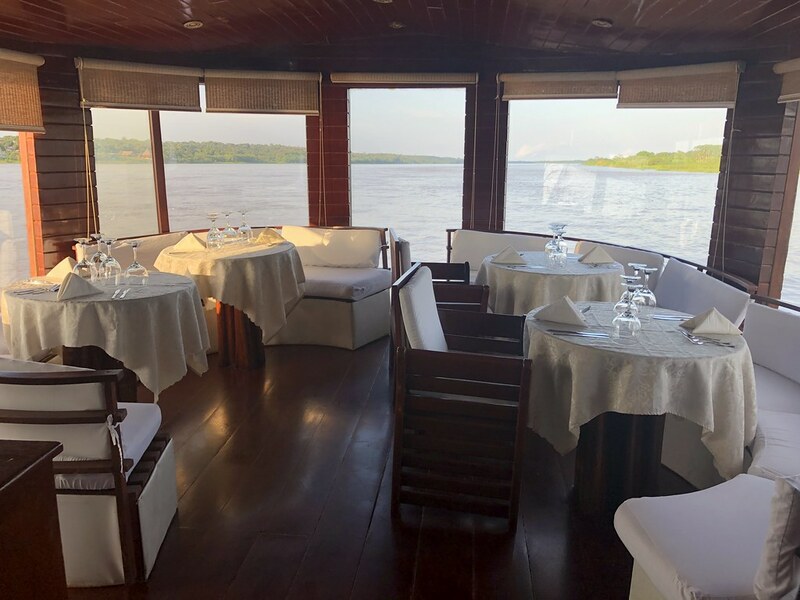 Our 75.5 foot boat had 8 crew members, 4 cabins, each with their own bathroom, as well as an observation deck, bar and dining room. We were super excited to have the entire boat to ourselves! 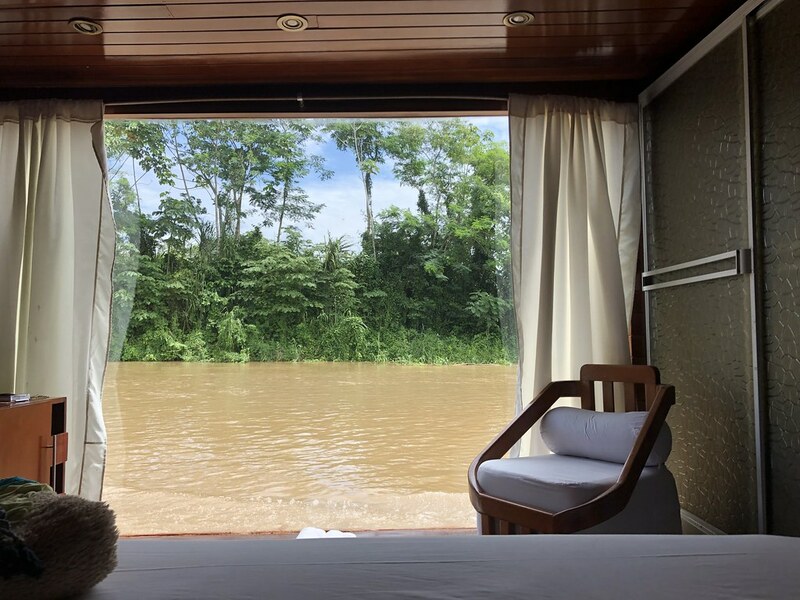 My room had a huge King size bed and floor to ceiling windows; I couldn't wait to watch the views of the river! As we got settled, our bartender Ronnie came to each of our rooms with some delicious fresh juice and cold towels. We would sail during the day, but moor at night. These rivers are very swift moving with lots of downed trees that can be very dangerous to boats. 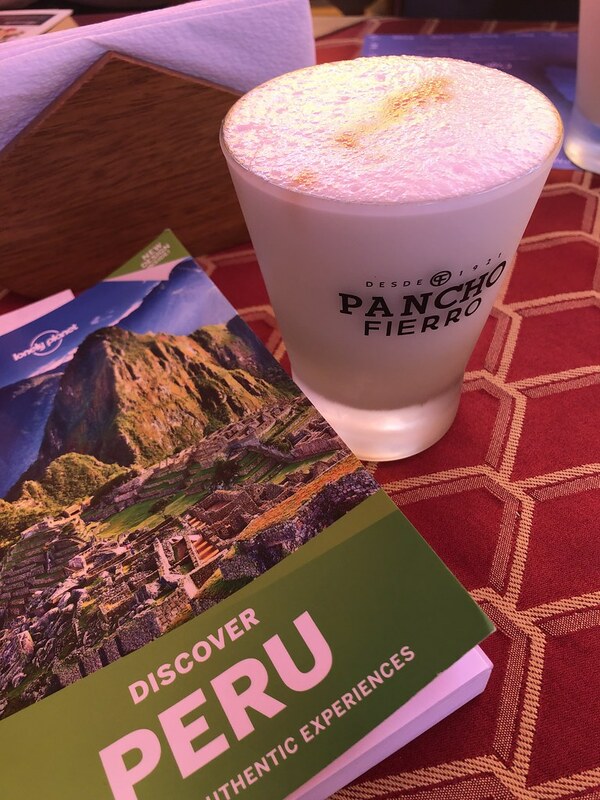 After settling in and exploring our boat, we had Ronnie make us a round of pisco sours and Forest set up a 1000 piece puzzle of Machu Picchu on one of the dining room tables. As we sat down to dinner we could tell that the boat was having problems with the A/C. Not something that we wanted to deal with in 100% humidity! The lights also started having some issues. 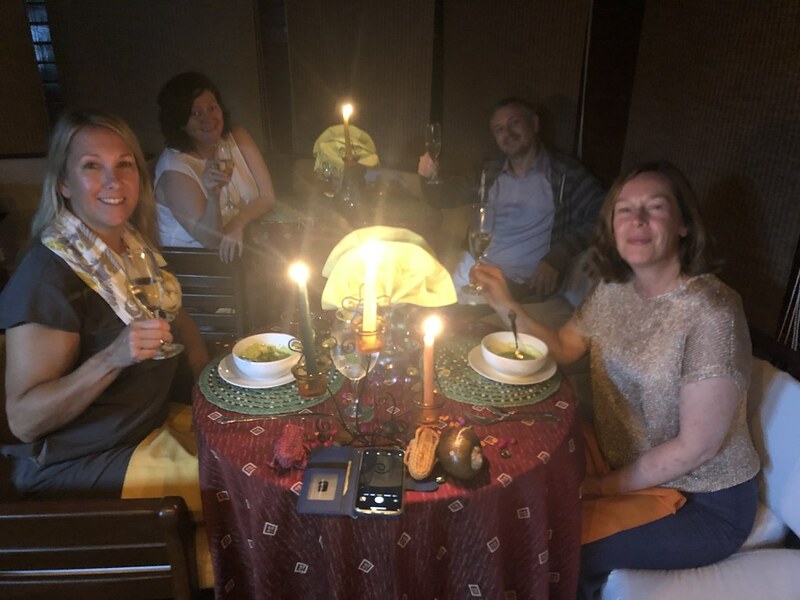 Luckily my room's A/C and lights were working fine so we all gathered there after dinner for nightcaps. It wasn't the best start, and the replacement came from the mainland at some god-forsaken time the next morning, but it was fixed! Our daily breakfast was an assortment of fresh fruits, yogurt, cheeses, meats, fresh juice from various Amazon fruits, bacon, grilled hot dog (?? ), and freshly cooked eggs. The coffee was terrible but the rest was great. 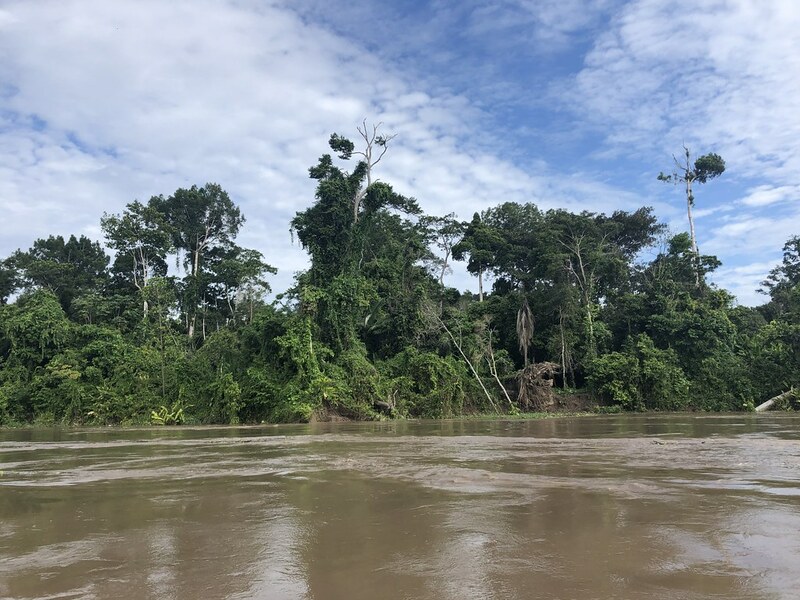 That first morning after breakfast, we boarded the skif and made our way on the Ucayali River to the Pacaya-Samiria National Reserve for a 2-hour hike thru the jungle. 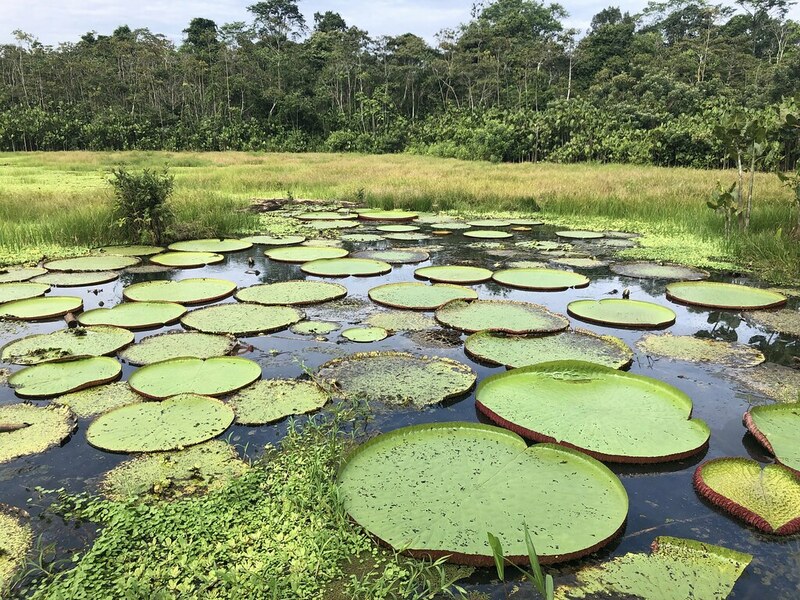 This protected area of the Amazon jungle is 8,000 square miles large and is home to over 449 bird species, 100 mammals, 69 reptiles, 58 amphibians, 256 fish and 1,204 plants!!! It was very warm and very humid but with mosquitoes acting more like piranhas we were encouraged to cover up fully. Because of the muddy trails, Caitlin and I also borrowed wellies from the boat, they were suppose to have a pair in each our size but didn't. 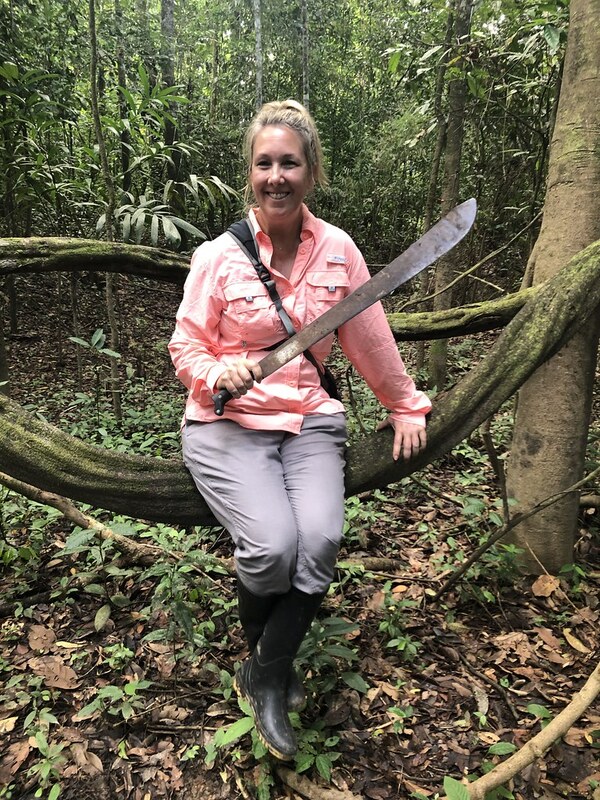 Hilde led us through the jungle, hacking away with his machete when the vines were over growing the path. 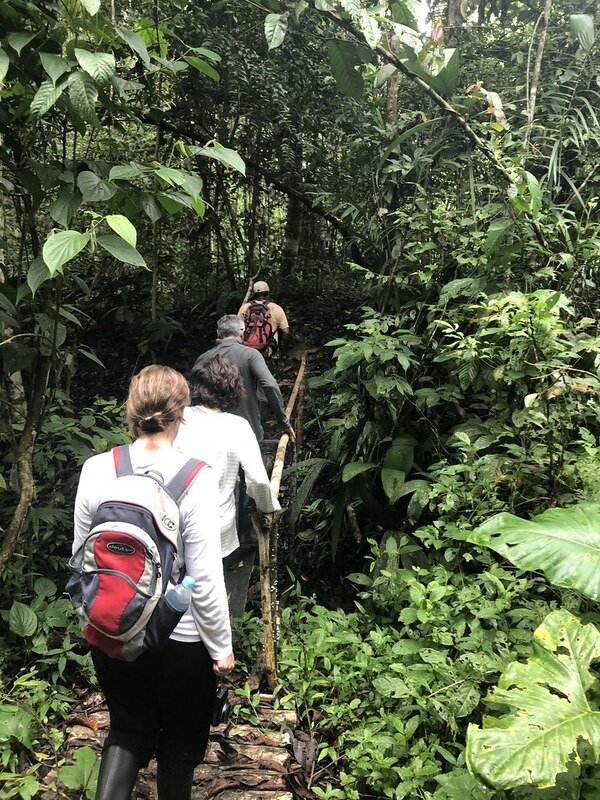 I've hiked in the jungles of Costa Rica and this was completely different! First off there were no other people anywhere around! Just four of us following a guy with a machete! 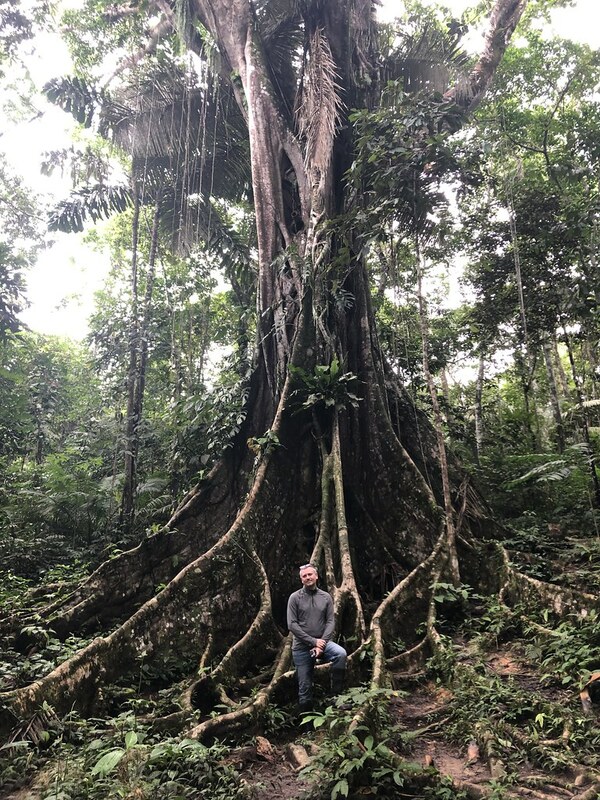 With so many species of plants and trees in the rainforest, Hilde did his best to show us as many as possible. He cut into trunks to show us the sap; some rubbery, some reeking of garlic, others of natural camphor. Shamen still live in these areas, treating the locals with natural remedies. We also met up with a local man John, who seemed to be hired by Hilde to spot things for us. 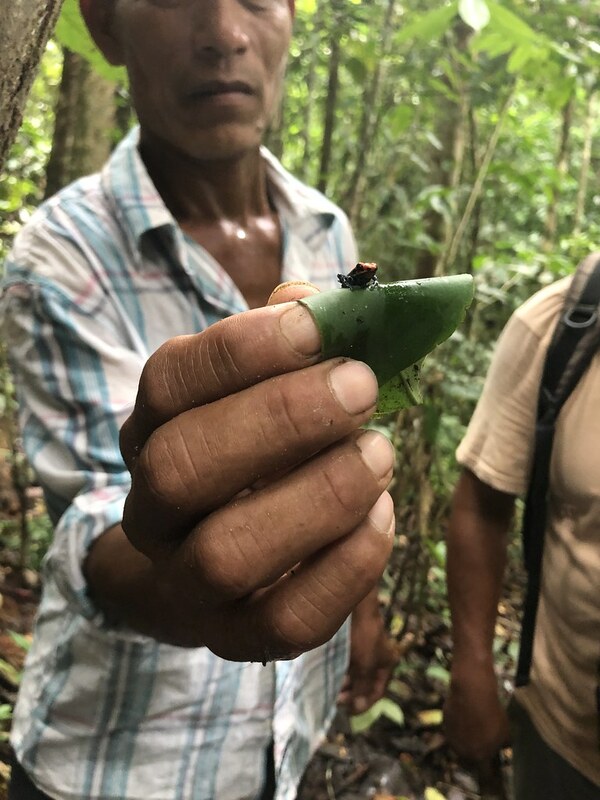 He brought us a poison dart frog, insanely tiny and perched on a little leaf. When we were done taking photos, he let the frog go and we watched it hop away. 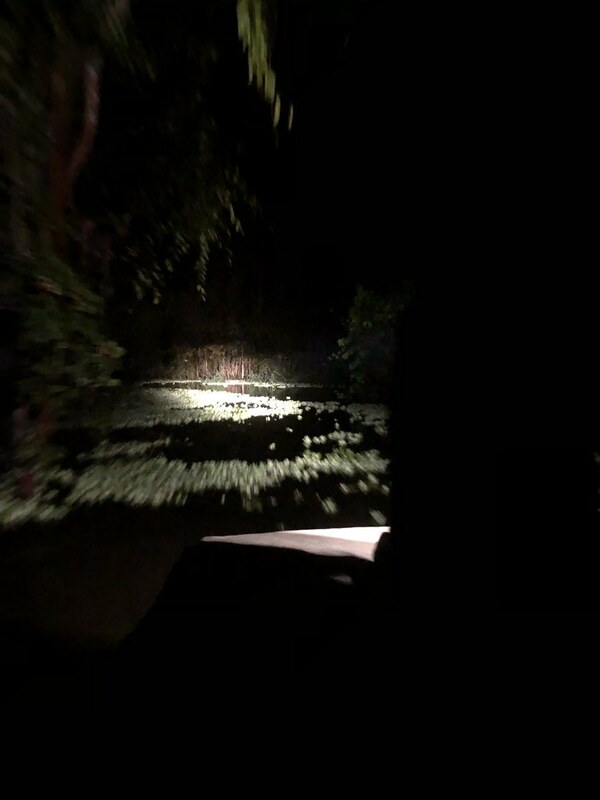 A bit deeper into the jungle, and near an impossibly large kapok tree, John brought us a fruit bat to check out. Again, it was released and flew high up into the tree. 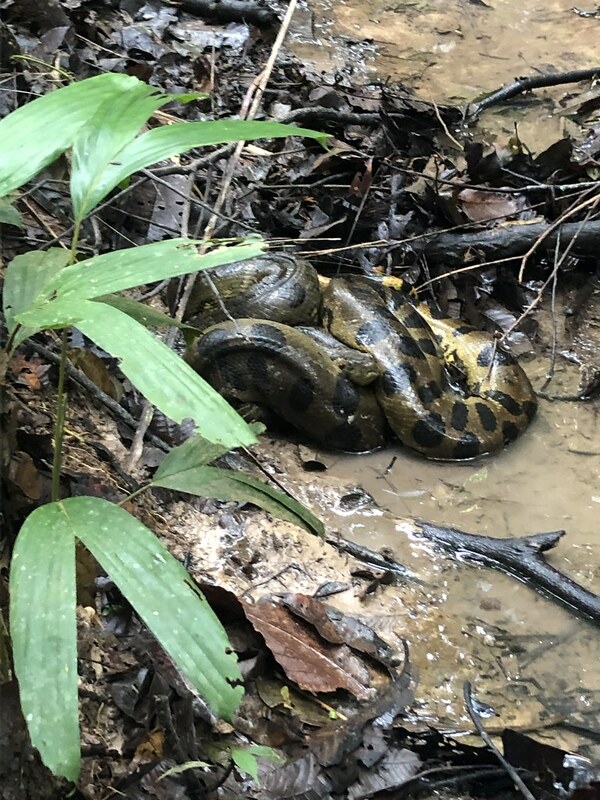 And finally, as we were nearing a stream, we could hear John yelling to Hilde... ANACONDA! We found him off the trail on the bank, pointing excitedly to a very large snake coiled up in the water. Hilde was very excited and encouraged all of us to come down into the stream and take a closer look. "I'm good here, that's what zoom is for!" was my reply! Continuing back on the trail, we were crossing a bridge over the stream and as I looked back at the snake I noticed it was slithering away up a small embankment. And it was pretty damn fast!! Hilde and Thibault took off in chase with videos going while us girls watched from the bridge. It was a pretty adventurous hike, and it wasn't even lunchtime yet! 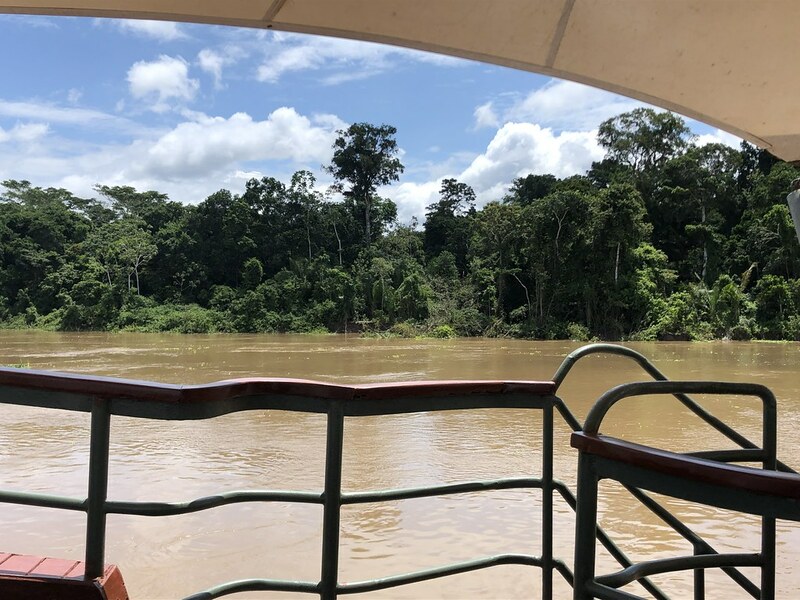 All Amazon jungle photos here (including a video of the anaconda). After spending Christmas in Miami, Forest and I are were off to Peru (my 46th country) for our annual New Year's Eve trip! We had business class seats on LATAM airlines and were looking forward to a relaxing and boozy flight. 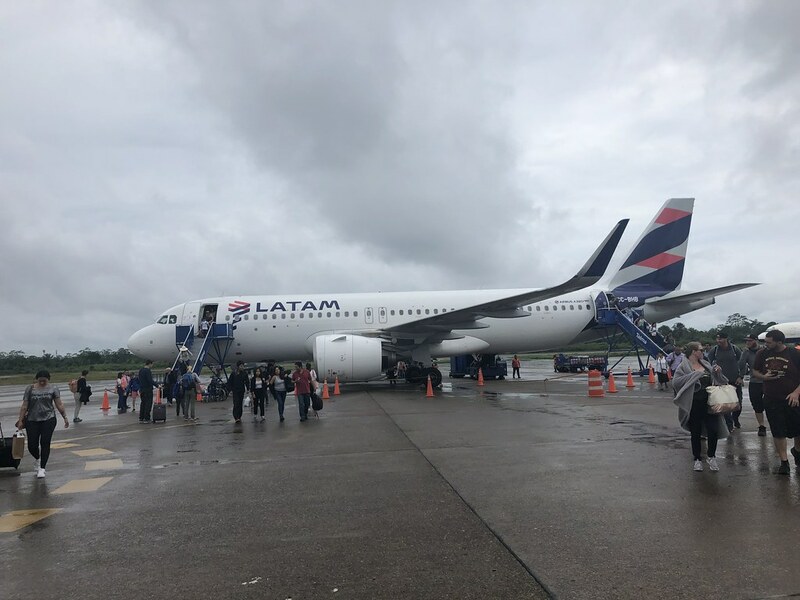 Now I've flown in business class on many different airlines (and it's hard to complain about any business class) but I have to say that this LATAM flight was soooo disappointing! The seats were really old, the leather ratty, and the buttons sticky. ugh. They did lay flat, and they were comfortable so that was good. There were no amenity bags; no slippers, no eye masks. For a 5 1/2 hour evening flight? I've flown coach internationally and have had that! 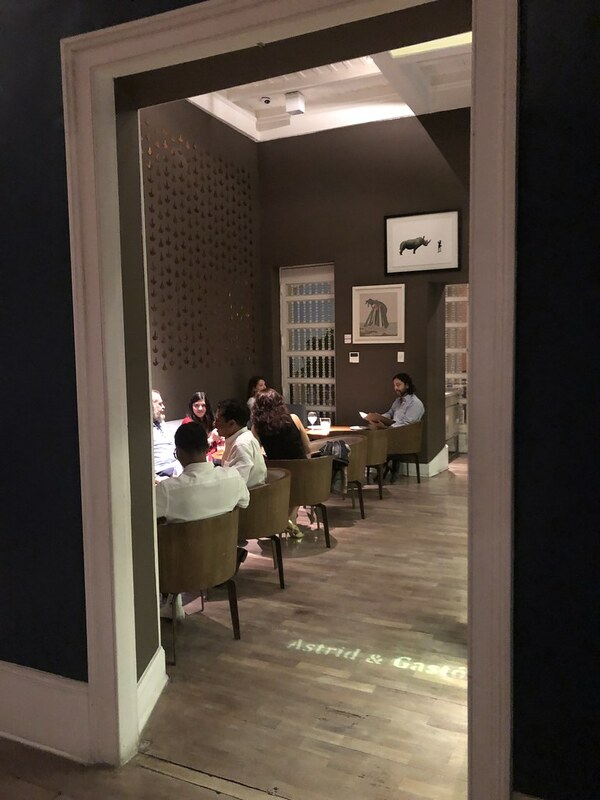 There were no menus handed out, no courses to the meal (the salt on the tray was Himalayan pink salt which we thought was quite bougie however), and we had to continually ask for beverages. Really poor service which really seemed not very different from coach. If that is how business class is, I probably would be really disappointed in their coach. Needless to say, I won't be flying LATAM internationally if I can help it again. Entitled rant over. 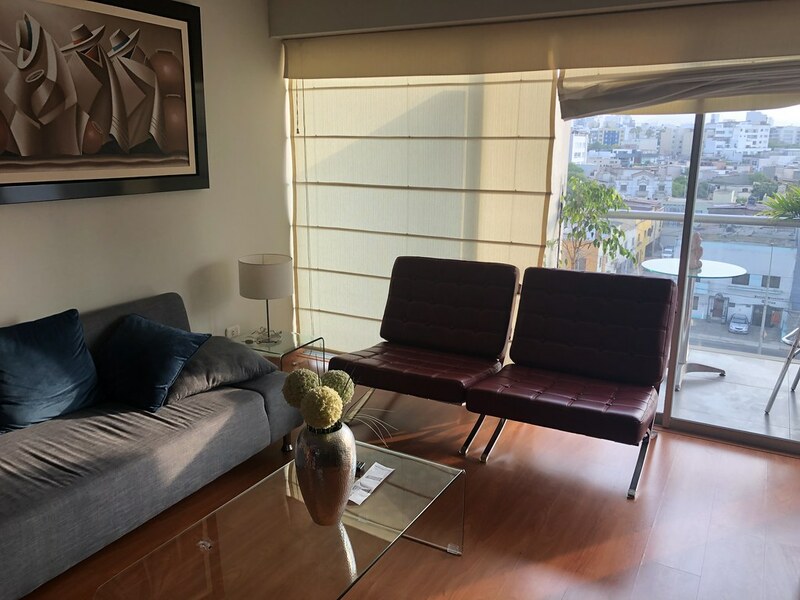 It only took us about 30 minutes to get to our Airbnb in Miraflores where we met Caitlin and Thibault who had arrived a few hours earlier. 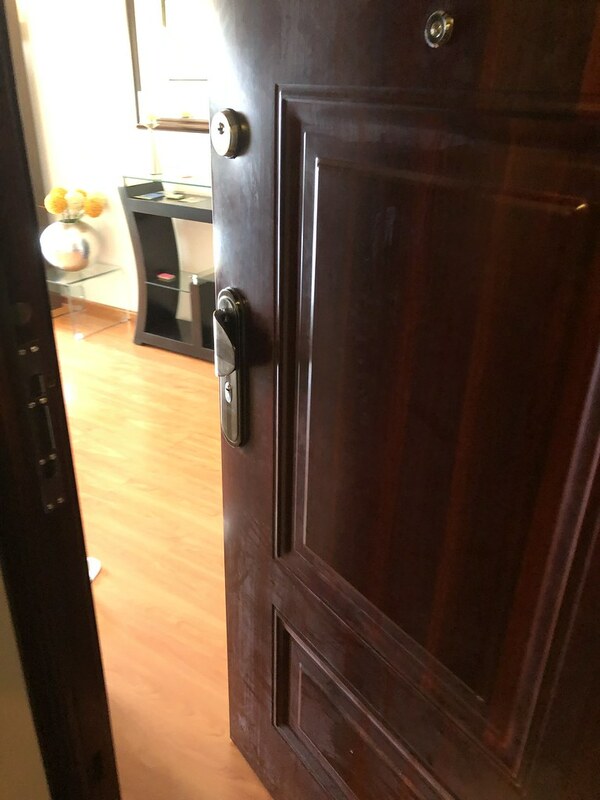 The apartment building had security and the elevator opened directly into our apartment. Very cool! It had 2 bedrooms and a small "maid's quarters" room off the laundry room. A big living room/dining room and kitchen as well as a small balcony. It was perfect for us and I'd recommend it to others. 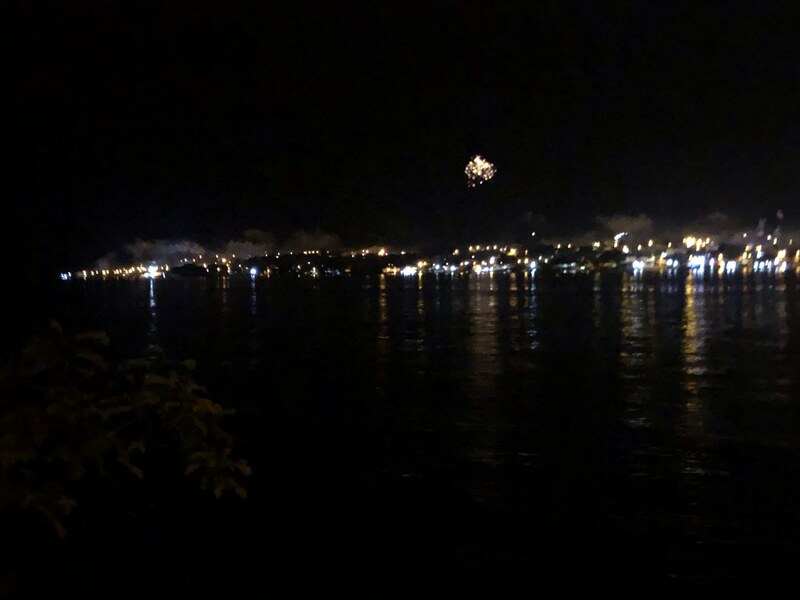 Since it was late when we got it, and Thibault had bought some empanadas for everyone, we just had a little bite and a nightcap and were off to bed. But the next morning we all headed out to explore our Miraflores neighborhood and walk around the city. First stop was Parque Kennedy, the central park of the area. 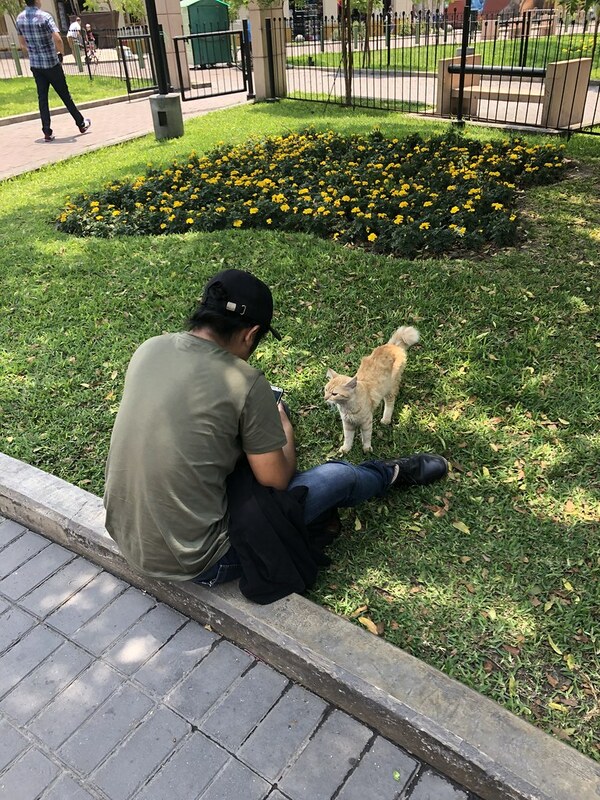 The park is filled with beautiful gardens, lots of vendors selling traditional Peruvian snacks, and cats! The cats were initially introduced to help get rid of a rat problem. Now there is a group that takes care of them and puts on adoption drives. And people go to the park just to play and hang out with the cats! We stopped for our first pisco sour at Cafe de la Paz, across from the park. pisco sours are the national drink of Peru. The local liquor pisco is a distilled clear brandy. We planned on trying a lot of them while in the country! 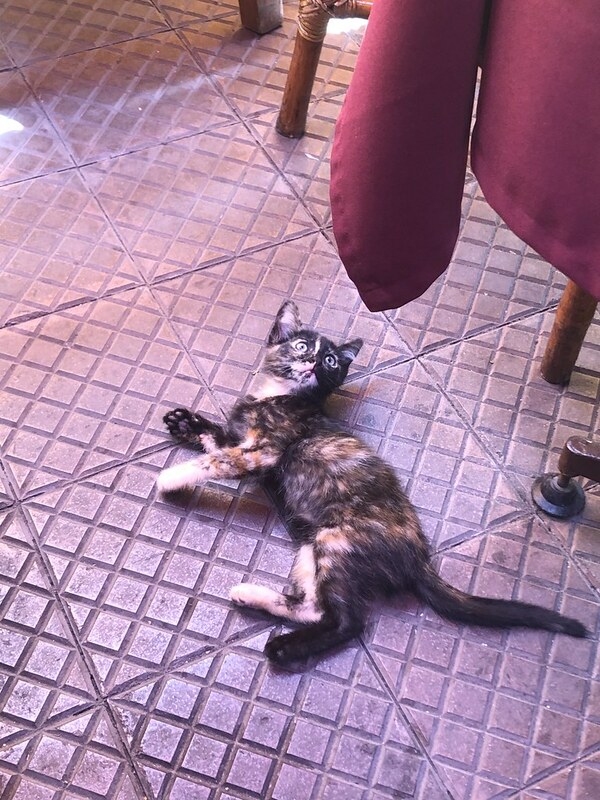 Being so close to the park, we had a tiny kitten stop by our table. She was not much bigger than my hand. Awwwwww! From here we continued on our walk and headed to Larcomar, an outdoor shopping center with fantastic views of the sea. This neighborhood of Lima is really quite pretty, and upscale. We never felt unsafe except for the near run-ins with joggers! 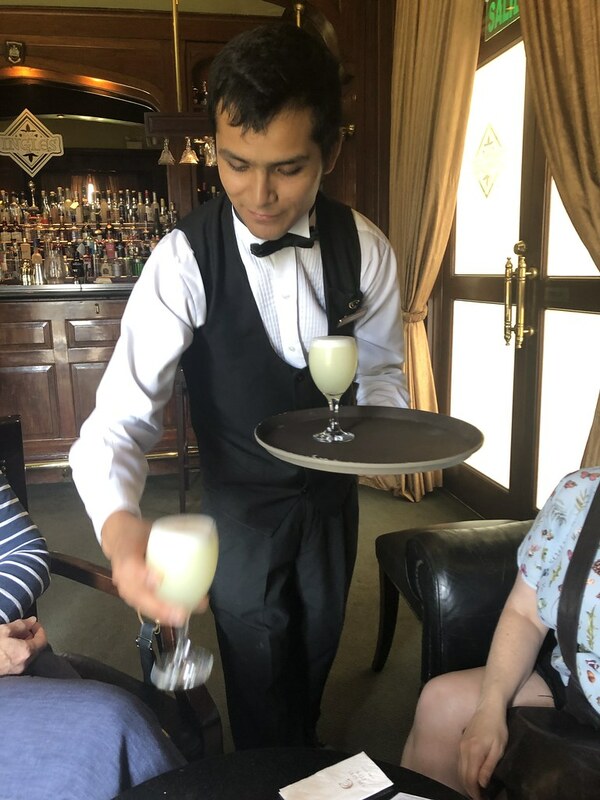 Lima also has a good network of Ubers so we called one to pick us up and whisk us to the Country Club Hotel for a pre lunch pisco sour. The hotel, which dates from 1927, is very old-school glamourous. In the wood-paneled Bar Ingles, we found a lovely menu of cocktails, both classic and contemporary. The drinks here were much more expensive than we'd seen elsewhere. 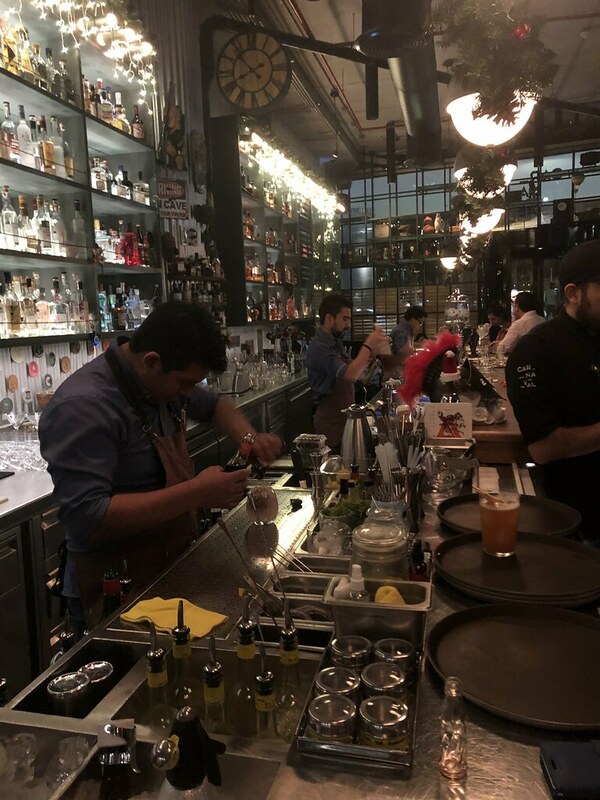 But the service was great, explaining to us all the different styles of pisco, and which ones lent best in certain preparations. We all ordered a round with a different expression, and all of us thought they were delicious! In fact, they'd be at the top of the list by the end of the trip. Thirst quenched, we Ubered to the very popular La Mar for a late lunch. 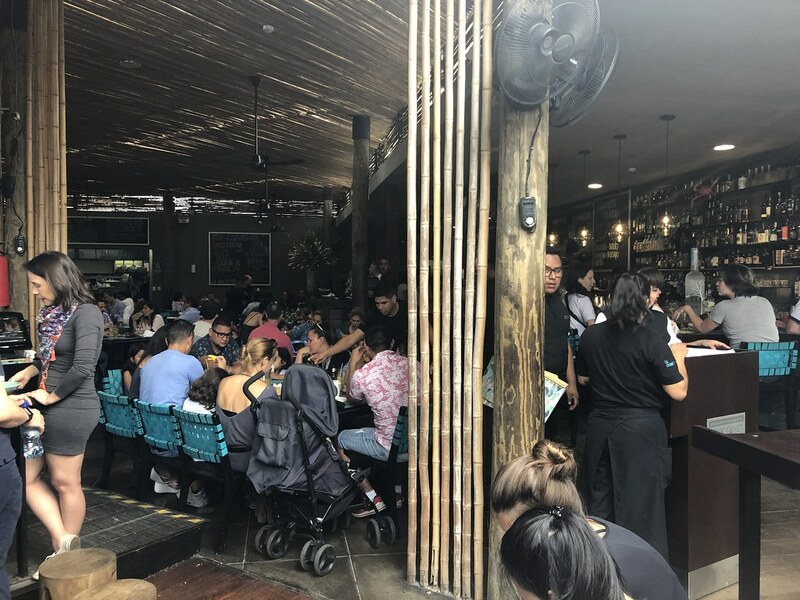 This restaurant, known for their ceviche, doesn't take reservations, so we figured showing up late on a Thursday would reward us with a shorter wait. Wrong. From what I could tell, this place is always packed. And for good reason! The food was some of my favorite of the trip! We waited with another pisco sour before being seated after about 30 minutes. 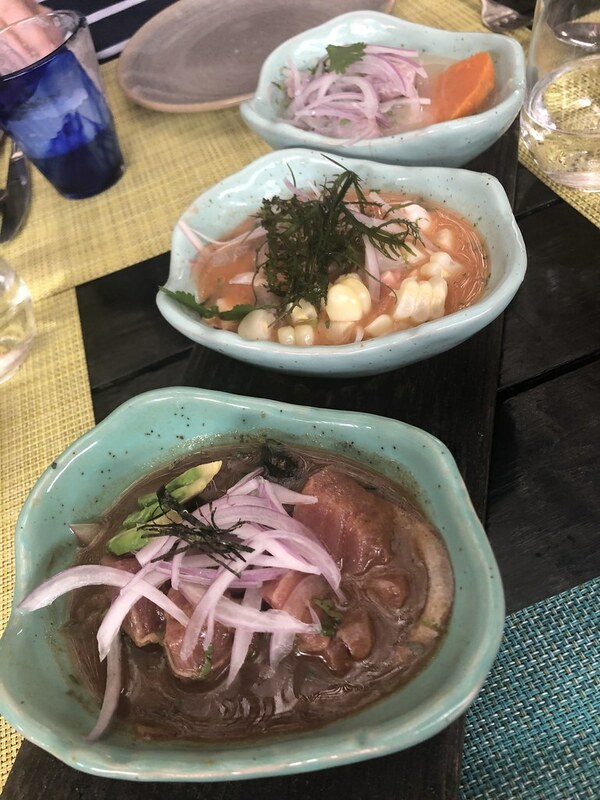 We decided to go with a combo of 3 styles of ceviche; the classic with white fish, the mixto with primarily shellfish, and the nikkei with tuna in tamarind marinade, referred to as leche de tigre. All were fab, but that tuna was really something! That evening we headed to The Reserve Park to take in some of the incredible Magic Water Circuit. 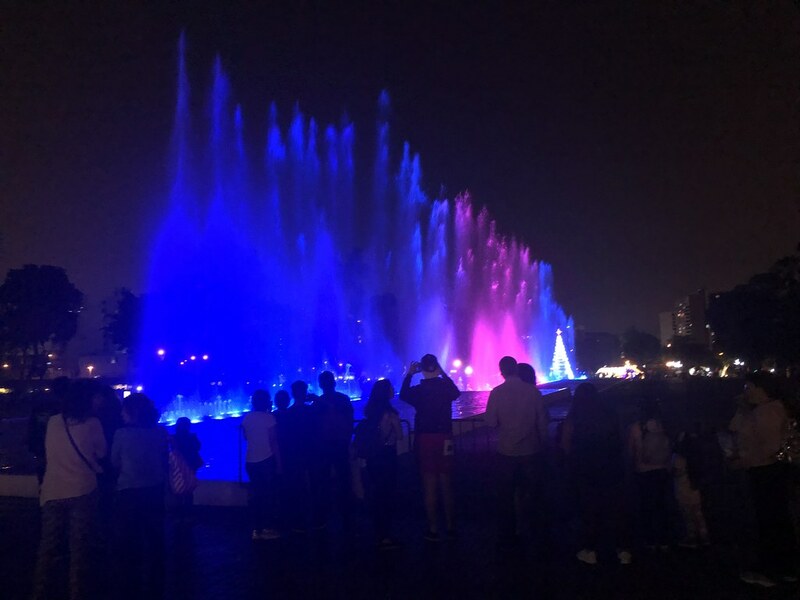 This beautiful park is filled with lit fountain displays of all sizes that run daily (except Monday). It's pretty incredible and I'd highly recommend it! Because of our tight schedule, we didn't have as much time to wander around as we should have. I'd give this a full hour if not a few. The park is large with lots of different fountains to see. Drinks were had at Carnaval Bar, a very fun spot with unique and creative cocktails. 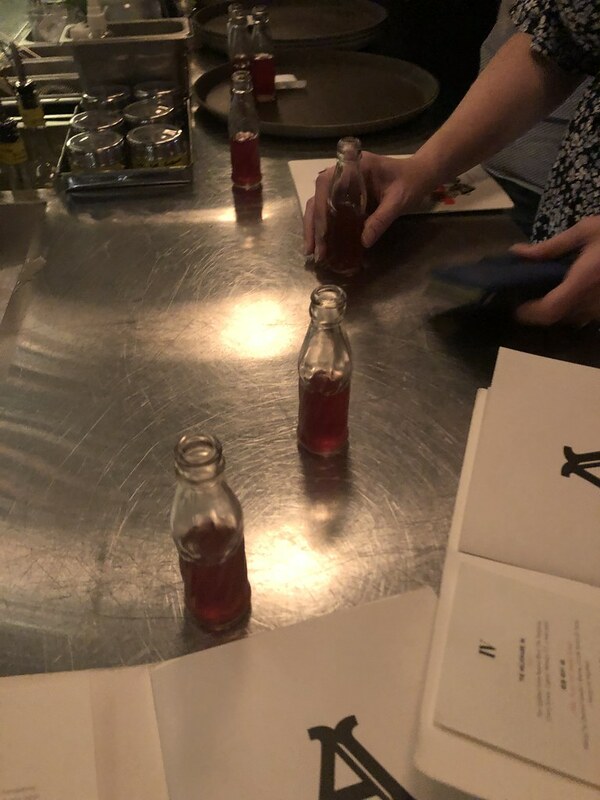 We were greeted with little bottles filled with a boozy libation to sip on as we perused the menu. The bar was really busy and originally we were at a stand-up, but soon the bartender found us a little booth we could share with some others. We settled in a for a couple of rounds of great drinks, great service, great atmosphere! I'd say it's a do-not-miss! After tabbing out, we made our way to Astrid y Gaston, housed in the amazing Casa Moreyra, a 17th century palace. The space is absolutely beautiful, with many rooms filled with gorgeous people dining on gorgeous food. I was surprised as I had expected something smaller. But I wasn't disappointed. I had made reservations for the á la carte menu as I wasn't sure what everyone would be in the mood for. When we inquired if we could change we were told no. I could have sworn I had read on the reservation site that it wasn't a problem to switch. But I just went to reread it and the menu isn't served past 9:30pm. So a little miscommunication due to language barriers let us to believe the service was a bit snotty. We were all pretty worn out from our full day of running around so it was for the best that we did the á la carte. 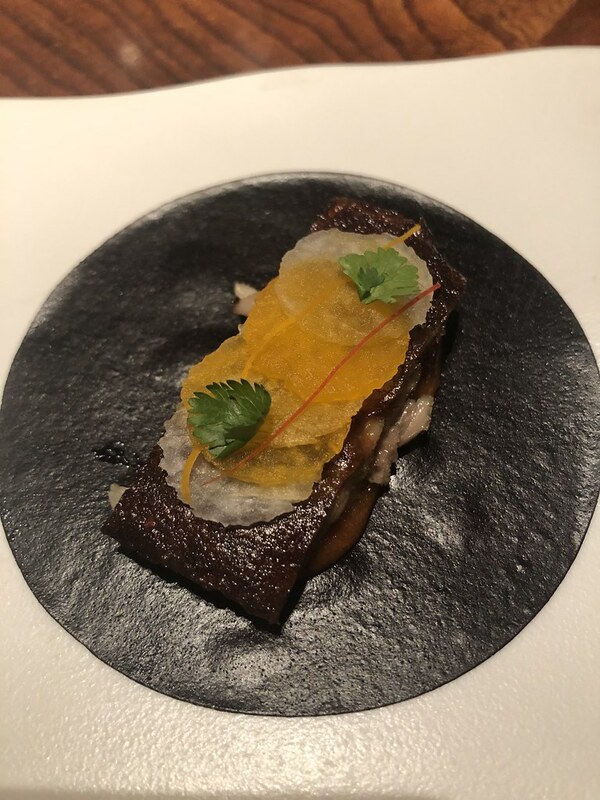 I started with this fantastic duck taco! And then I had my first cuy (guinea pig). This one was anything but traditional (grilled whole and served on a stick). 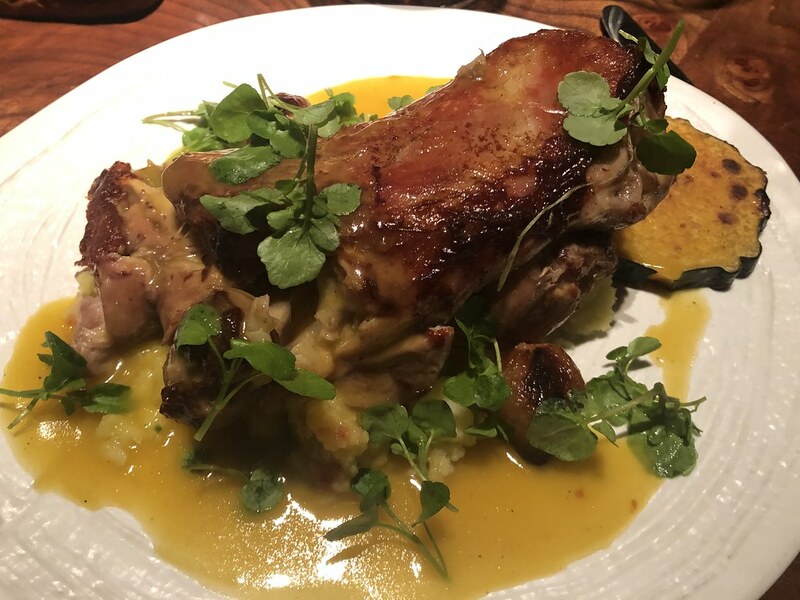 Crispy, tender, and served with corn gnocchi, the flavor and texture reminded me of suckling pig. Everyone enjoyed their dishes but we all agreed that the mains were entirely too big and the sauces were all a tad sweet for us. 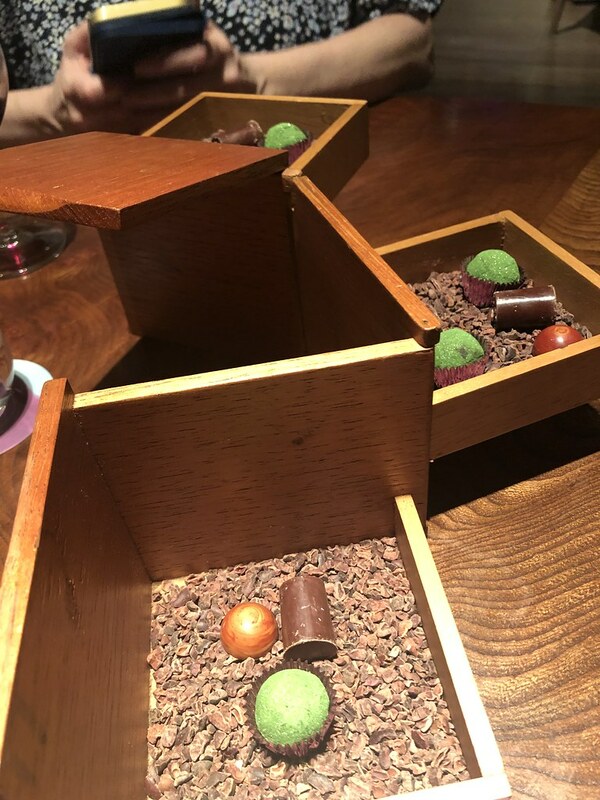 But the presentation and ingredients were lovely. Book well in advance if you plan on dining here! 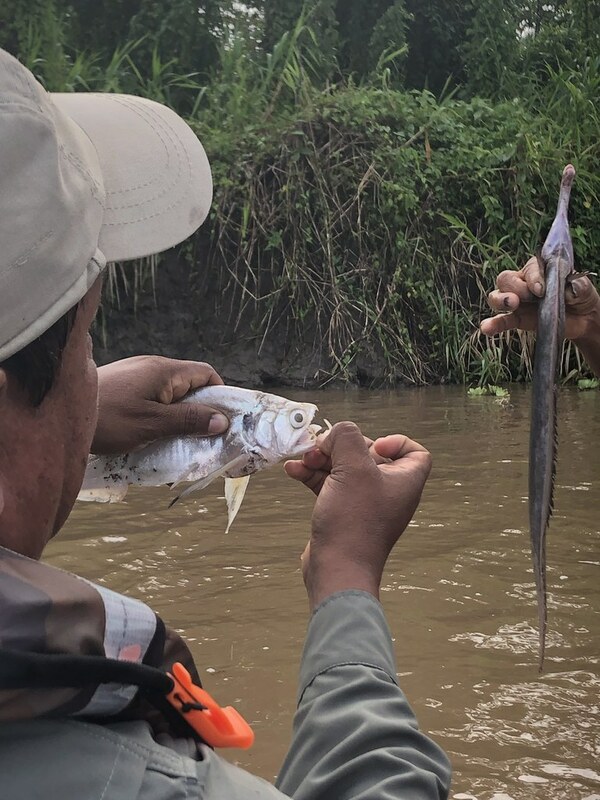 We'd be back to explore more of the City of Kings in 9 days, but the next morning we were up early, with our car service driving us through crazy insane traffic, to the airport so we could catch a flight to the Amazon River!